Just a while ago, we reviewed the Snapdragon 615 powered Walton Primo VX. The Primo V2 is yet another device with a Snapdragon 615 processor that Walton is selling for slightly less. The VX and V2 share similar specifications however there are some differences between the two that may help you choose which one suits you best. The V2 is made of plastic and odes not feature the metal plates that we found on the VX. The shape of the phone is very ergonomic, making the V2 one of the most comfortable smartphones that Walton has made. The removable plastic back subtly curves towards the device’s body, allowing it to fit snugly in the palm. Dual chrome accents go along all sides of the device giving it a distinctive look. The removable back is slightly textured and so is easy to grip. However our white model was very prone to getting dirty so if you choose to purchase a white V2, be prepared to wipe the back regularly. Under the hood, there is a large 3,000mAh battery. Unfortunately this battery is non removable. This sacrifice was necessary to keep the V2 8.9mm thin. If gven the option to choose between thinness and battery life, I would always choose the larger battery. The V2 weighs 130 grams and also features some thin bezels. The thin bezels make the phone feel much smaller and also make the phone easier to use single handed. The speaker is located on the bottom of the device which is a marked improvement from positioning it on the rear. Even though there are two speaker grills, only one of those is actually a speaker. Nevertheless the sound quality is pretty good and the position makes it a much better experience. Just make sure you do not cover the speaker when playing games, something which is very easy to do. The V2 sports a 5 inch, Full HD Quantum Sharp Pure Black IPS display. Walton has used this technology in many of its recent smartphones and we are not complaining. Images are nice and sharp due to the high pixel density and colours and contrast look good too. Viewing angles are okay but the maximu brightness level is a bit dissapointing. The display was difficult to use outdoors because of this but indoors, everything works just fine. The display is protected by Gorilla GLass 3 and should hence be resistant to scratches. The V2 runs a version of Android 5.0 Lollipop that is based off of the popular Lewa OS. At first I was not very enthused by this interface but I slowly grew fond of it. The OS has a number of built in customizability features including the ability to choose transition animations and also the ability to theme the lockscreen, icons and homescreen. The interface performs smoothly with barely any frame skips. No part of the OS is kept stock and this includes the settings and notifications panel. I personally like the look of the stock notification panel better but the one with the V2 is quite functional. Aside from the basics, Walton has also added some extra features of which double tap to wake and lockscreen gestures standout. On top of that, the V2 supports OTA updates which are always good in the long term. The main camera of the V2 is a 13 megapixel BSI unit with an aperture of f2.2. The camera takes nice photos in good daylight and lowlight images are good too. The selfie camera is the main highglight of this phone though. It is an 8 megapixel 88 degree wide angle unit with BSI technology and the same f2.2 aperture. Due to the wide angle lens, it is very easy to take selfies with large groups of people. The higher megapixel count also allows for some very detailed photos. The Primo V2 houses a 64-bit 1.5GHz octa-core Snapdragon 615 processor with an adreno 405 GPU and 2GB of RAM. This is the same configuration found on the Primo VX and performance is also indentical. We were able to play intense games like Modern Combat 5 and FIFA 16 comfortably with frame skipping only in the most intense scenarios. Gaming was enjoyable and multitasking was easy as well. The battery life separates the V2 from the VX. As the V2 has a larger 3,000mAh battery, it last almost one and a half days compared to the single day battery life of the VX. The V2 is therefore a better option for those who need their device to last the extra mile. 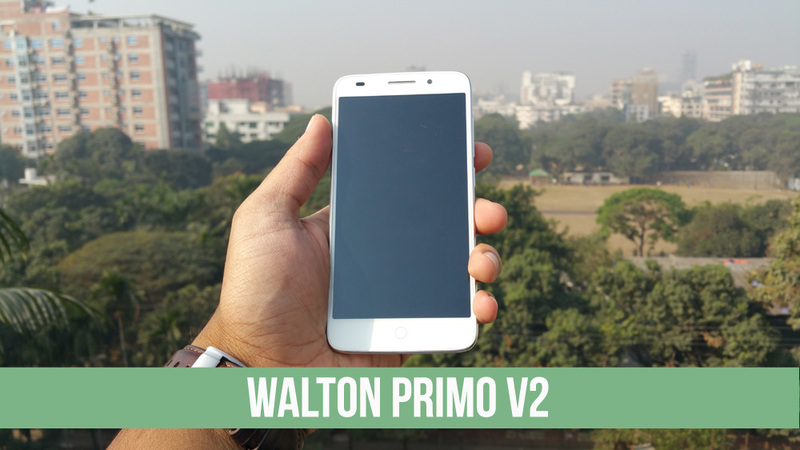 The Walton Primo V2 costs Tk/-15,990 and for what it has to offer, it is a nice buy. With a little less money, the V2 offers a better selfie experience and longer battery life than the VX. Aside from that, performance is identical. The V2 is an excellent option for those who have a more restricted budget but do not wish to compromise on performance.As such, it is a great device for most consumers. Thank you for checking out the written review. Please view the video review for more details. Stay tuned for more smartphone reviews!